We had a terrible weekend! Mom had an hallucinatory panic attack late Friday afternoon. Terry took her to St. Francis, on the recommendation of the head nurse at Presbyterian Manor. I met them in the E.R. after I got done at work - around 8pm. They did blood work, a CT scan, etc. and could find no medical reason; so they sent us to St. Joseph's Geriatric Psych unit around 2:30am Saturday. They transported mom by mini-bus, and Corby, Mike, Diana and I followed her over there. We sent Terry home at that point. We really thought that they would admit her; but we found out after they transported her there - there were no beds available! The next 6 1/2-7 hours were spent doing a video-hookup psych evaluation, waiting for results, and then waiting for them to find her a bed somewhere. They decided that she did need hospitalized, but they couldn't find any beds in the Wichita area. We were finally sent to the Hutchinson Hospital around 9:30am. We had sent Mike & Diana home around 5:30am when we thought she was going to Prairie View in Newton; but that fell through. Corby and I, zombies at that point, drove her to Hutch, where they immediately admitted her. After answering another round of questions - that's all I seemed to do all night - we finally left mom there and came home to sleep a few hours. She seems to be doing very well in the structured environment. They are testing new meds, and regulating them, so it will probably be a few more days (or even a week) before she is released. She will not be released to live independently though; she will have to go into health care at Presbyterian Manor, at least for the time being. She may be able to move to assisted living at some point. My main concern right now is what's best for her. I think she needs the individualized attention, as well as the structure. We are just taking it a day at a time! I got a call today from the people who bought mom's house. They had a few questions, and then offered to let us go look at the updates they've done. I went out there tonight, and am posting a few pictures that I took. Probably the biggest change they are making is putting a shower in the bathroom in the den. They took out about half of the pantry, and the shower is being installed. 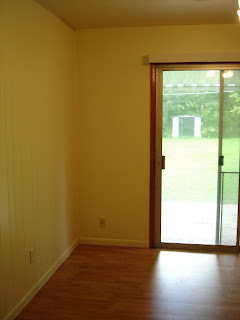 They painted the paneling in the dining room, put wood laminate flooring in the living room, the dining room and the hallway. They pulled out all the carpet, re-carpeted the bedrooms, and have painted all the walls and ceilings. 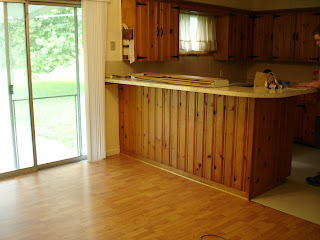 The first two pictures are of the dining room - note they painted the paneling! 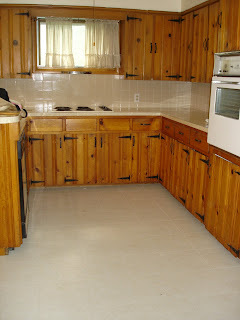 The third picture is the kitchen, where they put new linoleum. 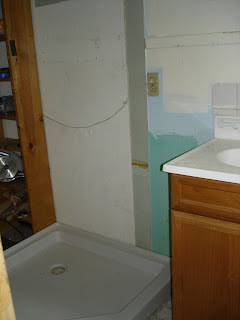 The last picture is where they are adding the shower to the second bathroom. I am currently reading a "3-fer" - three Nora Roberts books in one: Born in Fire, Born in Ice and Born in Shame. They are quick romantic reads - I needed something easy! You just have to drag your pictures down to where you want to place them. I write the text first, and then drag the pictures where I want them to go with my mouse. Good luck!